In an era of sloppy and forgettable action flicks on the one hand and overly serious “gritty” franchises on the other, the Mission: Impossible movies strike a pleasing balance between memorable action sequences and smaller-scale character intrigue. They’re whatever the opposite of “self-important” is. Fallout is not only the best pure action movie of summer 2018, it’s also the perfect culmination of the Mission: Impossible films so far..
Ethan Hunt and his IMF team, along with some familiar allies, race against time after a mission gone wrong. Oh, and Tom Cruise does some ridiculous stunts for your pleasure.. That’s all you need to know !! Mission: Impossible — Fallout isn’t exactly a smart movie, but it’s definitely a delightful one… It’s got that finely-tuned, perfect blend of every technical element that it takes to make a great action film, all in service of a fantastic script and anchored by great action performances to not just work within the genre but to transcend it. This is one of the best movies of the year. For the first time in this franchise, director Christopher McQuarrie has made what is basically a direct sequel to the previous film, “Mission: Impossible – Rogue Nation.” Wasting absolutely no time, “Fallout” drops viewers into the narrative, getting the important details out of the way so the action can get started. So many action movies spend forever with monologuing villains and extensive set-ups. But there’s no fat on this movie, even early on, where action so often takes too long to get to the “good stuff,” and definitely not late when the movie is intense enough to leave you exhausted. “Fallout” is one of those excellent action movies that works whether you pay attention to the plot or not. It is one of the most streamlined and fast-paced films in Hollywood history, moving from one set piece to the next. Don’t worry. There’s a plot !! And it’s actually an interesting one that feels both timeless and current in the way that it plays with loyalty and identity. But McQuarrie and Cruise are keenly aware that they can’t lean too heavily on the plot or people will lose interest. We don’t need speeches. And so the dramatic stakes of the set-up are pretty much enough. Nuclear bombs, a double agent or two, a homicidal mastermind—now go! 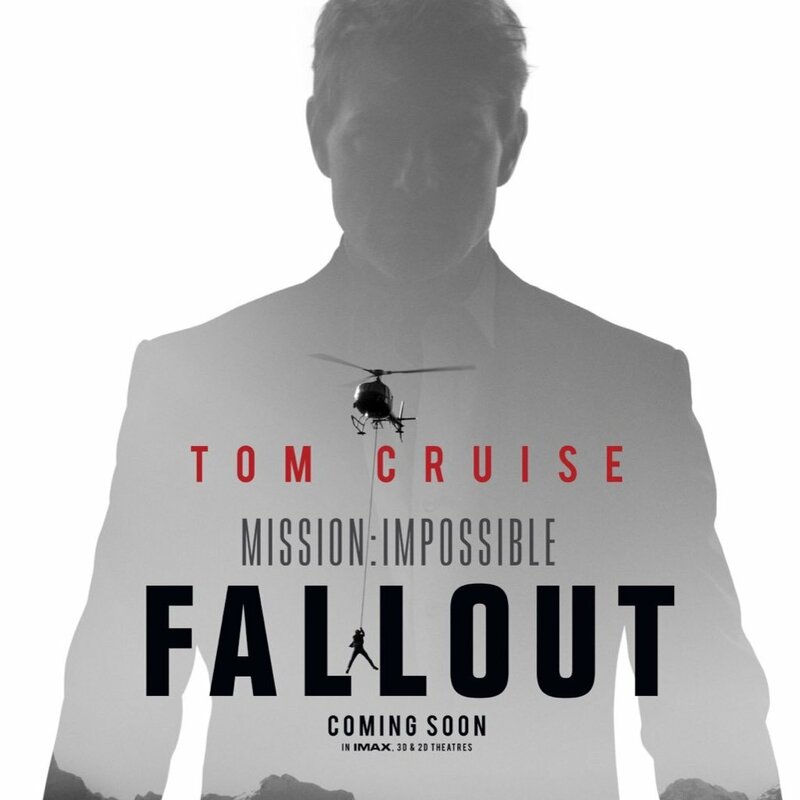 And of course, like all the other movies in the series, a new Mission Impossible entry brings another opportunity to see what kind of ridiculous stunts Tom Cruise, age 56, will put himself through for our viewing pleasure. Roughly seven of the ten best action sequences of the year will be from this film. There’s a wonderful diversity in action styles too from a skydiving nightmare to a car chase to, of course, a “Run Tom!” scene to the already-famous helicopter sequence. All of them feature an intensity of movement that we hardly see in action movies anymore. Critics have already compared the film to “Fury Road” and I think that’s why—the fluidity of motion that you see in both films. At the same time it’s fascinating to see how Cruise is finally allowing his age to show a little bit, especially in early scenes with Cavill, who looks like a tougher, stronger model of Ethan Hunt. Cruise’s latest version of Hunt stumbles a few times and his punches don’t land with the force of Walker’s. It instills more relatability in a character who would have been less interesting as a superhuman spy. And the supporting cast is uniformly strong, especially Cavill and Rebecca Ferguson, who has the screen charisma of someone who really should be a superstar by now. Cavill plays Walker as a living wall, a menacingly strong clod with a head as thick as his biceps (and his admittedly lustrous mustache). I don’t know how much longer this franchise will last… surely Cruise has to slow down eventually. But as long as there are Mission: Impossible movies like this, we’ll be guaranteed a good time at the movies. Perhaps the best thing one can say about “Mission: Impossible – Fallout” is that it destroys cynicism. It truly does what so many people have looked for in entertainment for over a century… a chance for real-world worries to take a back seat for a couple hours. You’ll be too busy worrying how Ethan Hunt is going to get out of this one to care about anything outside the theater. It’s a rare action movie that can do that so well that you not only escape but walk out kind of invigorated and ready to take on the world. “Mission: Impossible – Fallout” is one of those movies.